The Broken Spoke is a boot-slidin’ paradise, haunted by the ghosts of true country music, but don’t call it a dancehall. For starters, the joint on South Lamar Boulevard is a relatively young ‘un, opening in 1964. 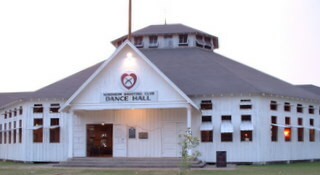 The majority of classic Texas dancehalls were built by Czech and German immigrants in the years between the Civil War and World War I to help keep their cultural identity alive. You know the Spoke is a honky-tonk, not a dancehall, because there are no foreign words on the walls like Wilkommen and Verein. There are no children standing on the shoes of their waltzing grandfathers. “The feel of playing in a great old Texas dancehall is probably like a Little Leaguer stepping up to the plate at Yankee Stadium,” says country singer Pat Green, who has a book about dancehalls coming out in February. “There’s so much history, yet as a fan, there’s such an intimate feel.” The walls of a dancehall are the arms that guide you in and show you around. The sole-polished wooden floors of places like Fischer Hall, 20 miles west of San Marcos, and Sefcik Hall, eight miles east of Temple, gleam and creak like reminders of the past, linking the dancers of today with a time when Texas was a land of immigrants. Nordheim Shooting Club Dance Hall. Not the other way around. From the time 16 Czech families landed at Galveston in 1852 until 1900, more than 15,000 Czechs lived in Central Texas, where they brought polka music and built halls like those back home, ranging from simple four-sided structures to spectacular 12-sided shrines. Germans, meanwhile, built similar halls in Fredericksburg, Comal County and, with Saengerrunde Halle, in downtown Austin. Founded by the fraternal orders, singing societies, gun clubs and agricultural organizations that still run them today, these halls were meeting places where such topics as life insurance and livestock protection were discussed during the week. And on Saturday night, the community danced. The halls were at the intersection of family life and single life. It’s still like that the first Saturday of the month at Twin Sisters Dance Hall, a German-founded hall on U.S. 281, an hour’s drive from Austin. Although Gruene Hall, which was built in 1878, is often recognized as the oldest dancehall in Texas, Twin Sisters owner Marvin Haas is out to prove that his hall is eight years older. He’s hired a translator to go over the old records, written in German, to find evidence that Twin Sisters was built in 1870. But none of this matters to the hundred or so who came out to dance on a recent Saturday. When the band opened with “Waltz Across Texas” – an anthem of Texas dancehalls if there ever was one – there was none of that first-song apprehension; the dancefloor filled instantly. There were old married couples dancing as they have been for 50 years, teenage girls dancing with each other, a mother showing her awkward teenage son, who never took his eyes off his feet, how to two-step. It’s a world that Texans often take for granted, one that newcomers are delighted to discover. “When my husband and I moved to Texas two years ago, I was completely thrilled to see so many old dancehalls still functioning,” says Steph McDougal, a native of Dayton, Ohio, and wife of a NASA engineer. Before moving here, McDougal did not know a thing about the Texas dancehall tradition. Today she heads Texas Dance Hall Preservation Inc., a nonprofit organization she co-founded with music historian Steve Dean and structural engineer Patrick Sparks. “We all came to our love of dancehalls from three different perspectives,” McDougal says. While McDougal studies the architecture for her master’s thesis, Dean is in tune to the indigenous Texas music born in these wooden melting pots and Sparks is a dancing enthusiast who discovered dancehalls during his years at Texas A&M University in the ’80s. “The story of dancehalls is really the story of Texas,” says Dean, who has long been researching a book on dancehalls he plans to complete in 2010. The very personality of Texas music is to serve the dancers, which is why Bob Wills added drums and Ernest Tubb’s band had an electric guitarist back when such instrumentation was considered sacrilegious to the Grand Ole Opry crowd. “We have all kinds of people coming to Sefcik Hall,” says Alice Sulak, 74, who carries a trace of a Czech accent. “But the one thing they all have in common is that they love to dance.” Her father, Tom Sefcik, built the hall along with the downstairs saloon in 1923. It remains virtually unchanged today, aside from the solid oak dancefloor that was installed in 1953. It was inevitable that dancehall enthusiasts McDougal, Dean and Sparks would meet, but they didn’t officially team together until January, when DeWitt County’s Gruenau Hall, with its glorious hardwood maple floor and hand-carved rafters, burned to the ground. Insurance on the building would cover only one tenth of the cost to restore it . One historic hall that has come back after two decades of dormancy is Swiss Alp Dance Hall, built in Fayette County, 10 miles south of La Grange, by German settlers in 1900. Originally a polka palace, the hall, like most, switched to country music during the Western swing and honky-tonk heyday of the 1940s and 1950s. Then, in the ’60s, it became the place to see regional rock ‘n’ roll favorites such as B.J. Thomas and the Triumphs, Roy Head and the Traits and a pre-bearded ZZ Top. The hall closed in the mid-1980s, and the owners concentrated on running the convenience store in front. Two years ago, a couple from Houston – medical product executive Kevin Ustynik and his wife, Donna – were driving around Fayette County, where his parents live, looking at houses. They saw a “For Sale” sign on U.S. 77 and pulled over. The property for sale included 26 acres of farmland, a ranch house, a storefront and the dancehall. “We didn’t set out to buy a dancehall,” Ustynik, 46, says with a laugh. “We had to think long and hard about whether we wanted to get it back up and running.” A visit from his parents made up his mind. From the back windows of the hall they pointed to a bluff where a group of Czech families settled in the late 1800s. Ustynik’s great-great-grandparents were among them. Ustynik’s grandfather was a drummer in a polka band, so he had undoubtedly played Swiss Alp Dance Hall. While working as a medical equipment consultant, Ustynik and his workers slowly restored the dancehall and reopened its doors in April 2006. There are country music dances every Saturday night and, in the spring, Ustynik plans to start Sunday afternoon polka dances. Donna Ustynik, meanwhile, manages the Czech/German restaurant in front, where the store used to be. “Every night we’ve been open, we’ve had people come up and tell us interesting things about the hall,” Kevin Ustynik says. “See this area over here, off to the side?” he says, pointing to a railed-in square at stage right. “This is where the parents used to stand during a teen dance. If a guy asked a girl to dance, she’d look over at her parents for a signal that he was OK, or that he wasn’t.” Swiss Alp also had a crying room because dancehalls are nightlife without the need for babysitters. There is no trait as admirable to a true Texan, than keeping tradition alive. This entry was posted on July 30, 2011 at 7:32 pm	and is filed under Music, Texas Music History. Tagged: Broken Spoke, Dancehalls, Pat Green. You can follow any responses to this entry through the RSS 2.0 feed. You can leave a response, or trackback from your own site.